Chef also enjoys coaching and preparing gourmet foods for small home gatherings and regularly caters to events at art galleries in southern California. Chef has taught food classes in healthy low fat cooking and regularly conducts his classes in the local city services systems for many cities also in Southern California. Chef Jorge has been teaching cooking workshops for over 15 years. He does this because it keeps his cooking skills sharp but most importantly teaching keeps chef Jorge on top of all the new trends. This benefit the clients that the knowledge is available and we are not practicing with our clients’ dollar. When marketing their food products or services. 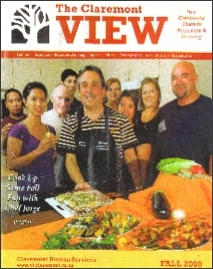 Let Chef Jorge Bruce Cater or coach your next event or gathering. culinary arts in Los Angeles to learn gourmet-cooking techniques. He enjoys a diverse and rewarding career. He brings over 15 years of experience to his guests. He is also a published author selling over 250,0000 cookbooks nationally. Titles include the first and second edition of Better than Bouillon, Low Fat No Fuss, Cooking with pesto, Crockery Gourmet and he is currently working on his healthy cooking cookbook based on the alkaline diet.